I wanted to do two things tonight: 1) Paint something from my mind. 2) Experiment with a looser style. I decided to try to paint a figure, because I need practice. Painting figures from a reference photo is a crutch of sorts, because I end up measuring and measuring again, and I learn more about how many eyes wide that person’s head is when it’s tilted at that angle, but I don’t learn about proportions of a human figure. So I read a bit online, and watched some tutorials about human proportions, and sketched some figures on graph paper to learn a bit more. Then, I sketched out what I wanted to paint. 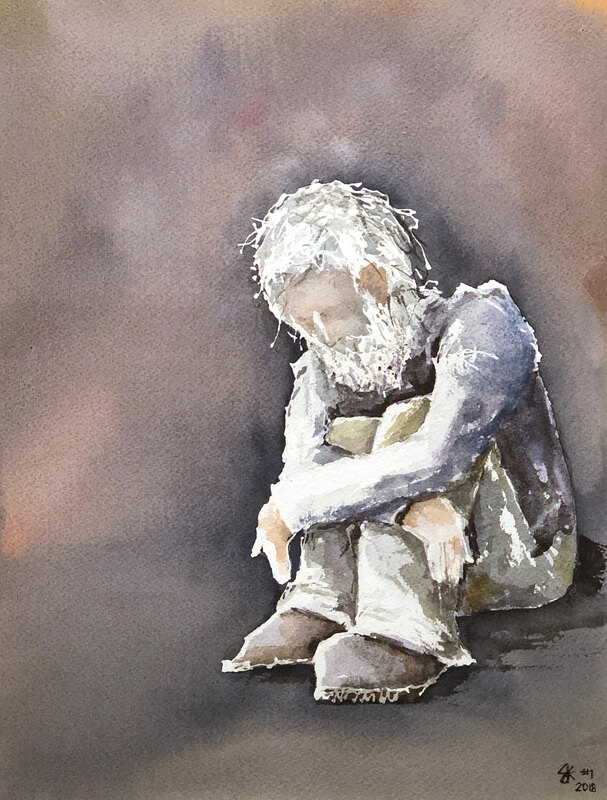 I wanted this to be a painting of a homeless man, and wanted him to be mostly faceless. The idea was to get myself to think about the person and his story, to generate some empathy for the guy I tend to just walk by without a thought, and to pair that empathy with a rebuke to my tendency to just walk by someone. This is a painting of a man I met on the side of the road in Pittsburgh about ten years ago. His name is Len, and I sat and talked with him for about thirty minutes about nothing in particular. I will never forget Len, but there are so many other “That Guys” who I just walk right by without a thought. I want to try to be better at that. I want to start saying hello, and sitting down with them sometimes when I am able. I thought about naming this after Len, but decided to name it “That Guy” because it’s a challenge to me to encounter another “That Guy” the way I encountered Len.